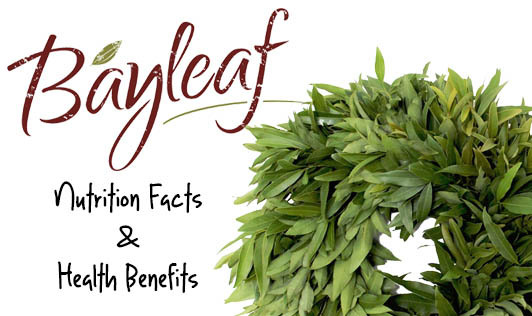 Bay leaves are known to have pungent flavor when eaten whole and are somewhat similar to cinnamon. They are normally used in fresh, dried, or powdered form. The oil extracted from bay leaves, called bay leaf oil has medicinal properties and is widely used in treating several ailments. Bay leaves have been found to be very effective in managing diabetes as they cause a reduction in blood glucose, cholesterol, and triglyceride levels. Because they contain antioxidants in rich proportions, bay leaves enable the body to process insulin more effectively, thus making them a good choice for diabetics and people with insulin resistance. Bay leaves are considered good for digestion and they can be used in the treatment of digestive disorders such as heartburn and flatulence. Bay Leaves are also considered good for heart ailments as the relieve stress and avert all cardiovascular diseases. Bay Leaves are good for clearing the throat and they are very efficient in fighting against bacteria that cause cold and flu. Bay leaf contains caffeic acid and catechins which possess chemo-protective properties that provide resistance against different types of cancer. In Indian cooking, bay leaves are more commonly added to biryani and pulav, and other rice varieties. Alternately, to reap more nutritional benefits, one can add a single bay leaf to English tea or green tea too.